At long last you have calibrated your brewing equipment and plugged the data into BeerTools Pro. Now you face the tedious process of entering your calibration data each time you start a session, OR simply using a template. Templates can be a very powerful tool in your brewing kit. What are templates...and how can they be used? Templates eliminate the need for entering commonly used settings over and over again. A template can save any aspect of a session that a brewers repeatedly uses. Somethings rarely change from batch to batch such as equipment (and the associated calibrations), batch volume, and brewhouse efficiency. Some brewers commonly use the same ingredients (I.E. clarifying agents or certain minerals) in all of their recipes or they repeat certain aspects of the mash schedule. The default template is very useful because it serves as the basis for every new session created in BTP. Setting up a default template with your equipment settings and other useful information will automatically insert that information when you start up a new session. The default template is set up using: File Menu &GT; Make Default, Doing this saves a special file that gets loaded automatically when opening a new session. Template files are basically the same as session files except the user can choose which portions of the file to save. A template is saved by choosing: File Menu &GT; Save as Template. The user is presented with a configuration panel. The check boxes represent each group of data that will be saved in the template file. When a category of data is checked in the configuration panel it will replace that same data in the file that the template is loaded into. For example, if ingredients are included in the template, these will replace the ingredients in the file the template is loaded into. Un-checking a category of data in the template panel will result in that group of data having no effect in the session that the template is loaded into. To load a template into an existing session choose: File Menu &GT; Load Template. The combinations are endless. Some users set up one master template file that pre-fills all of the reused data. 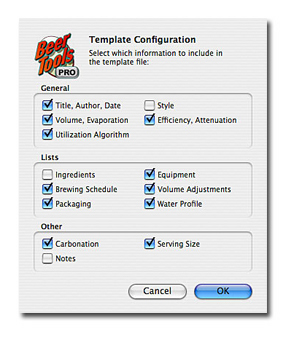 Other brewers have several templates for different situations like a packaging template, or templates for types of mashing. So if you have a template that works for you...share it with others. Do you need help with setting up something specific? Ask a fellow BTP user for an example template.